Scooby Doo birthday party ideas for kids. Fun ideas to celebrate a birthday with everyone's favorite Great Dane. Send a small box of cookies as the invitation and turn them into Scooby snacks by printing out party information on one large label and "Scooby Snacks" on another and sticking them on each side of the cookie box. Brown cards with black polka dots. Buy plain brown cards and glue on a strip of turquoise ribbon for Scooby's collar on the front of the card. Then cut out gold rectangles and print SD on it and glue to the turquoise collar. Address the invitations Scooby Style by replacing the first letter of the guests name with an "R" ... Susie would be Rusie, Tom would be Rom. Decorate the party table in brown and black with turquoise highlights (such as the flatware, napkins and/or cups). Buy new plastic dog dishes in black and brown and set them at every guests place. Write their name on the dish with a black permanent marker (or you can let the kids decorate their bowl as a party activity at the beginning of the party when you are waiting for everyone to arrive). Serve the guests ice cream and cake in the bowls when it's cake time and later they can take the bowls home as a goody bag to hold their party favors. Make name tags and/or place cards for the guests Scooby style by replacing the first letter of their name with an "R". Let the party guests create their own Scooby Doo collars. Make them from 1 1/2" wide turquoise ribbon or longer lengths of turquoise string. Let the kids cut out and decorate their own dog tag from poster board or cardstock. Punch a hole in the dog tag and hand it from their collar. Use our free homemade face paint recipes to make face paint to give the guests Scooby Doo noses, whiskers and black spots. 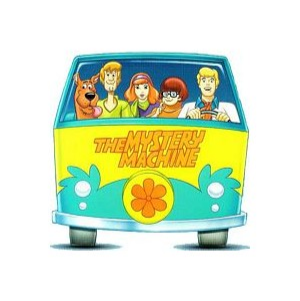 Make or buy a piñata that looks like the Mystery Machine. Fill with candy and toys and let the kids take turns trying to open it. Before they begin give each party guest a turquoise or brown paper bag to hold their treats when the Piñata is opened. For piñata instructions and help setting up a piñata see our piñata help page. A fun twist to the scavenger hunt is to let the guests hunt for dog bones you have hidden around the house, yard, park or party area. Use plastic bones or real dog biscuits and hide them around the yard. Or make it a ghost hunt and hide plastic ghosts or suckers covered with a small square of white fabric and tied with a ribbon to resemble a ghost. Before the party write down a number or symbol on a few of the bones that you are hiding. The party guests who find the "special" bones with the numbers or symbols win a small prize at the games end. Scooby usually ends up rounding up the ghosts in his adventures ... and this game is a crazy representation of just that! Blow up several white balloons. During game time divide the kids into two teams and give teams a broom and three white balloons. The first person in each team must take the broom and herd the "ghosts" across the playing field, around a set turn around point and then return. The next player takes the broom and herds the balloons. The first team with all of their members to finish the ghost herd wins. If a balloon pops during the game they must run back again to the start and begin with a new balloon. Have several blown up balloons ready for replacement near each team. Serve ice cream sundaes in new plastic dog dishes. Decorate cookies to look like Scooby's dog tag with an SD in the center. Scooby Snacks - any type of cracker or small cookie can be labeled as a Scooby snack. Small individual packages of cookies or crackers labeled "Scooby Snacks"
Brown and/or Turquoise paper bags tied at the top with ribbon (fill bag with treats, fold over the top, punch two holes in the top that has been folded, thread ribbon through the holes on each side and tie in a bow at the front of the bag. Decorate Chinese takeout boxes to look like the Mystery Machine or buy brown boxes and draw on black spots with permanent marker. Use new / clean dog bowls to hold the favors.